People may think that dog bite attacks are relatively rare or that this will never happen to them. California dog bite emergencies are anything but rare. The State of California reports that more than 38,000 people in California reported to emergency departments in 2015 because of injuries suffered in dog bite attacks. That equates to more than 104 people per day, or more than one person suffering injuries in a dog bite attack in California every 15 minutes of the year. This is a serious and ongoing problem. You’ll need to seek an attorney for financial recovery from dog bites. People love their dogs, and dogs are an important part of our American culture, our lives, and our families. They are loyal companions, they add a lot to the lives of their owners and they provide valuable services to the police, military, and people with different medical challenges. However, it’s important that people understand the nature of dog bite attacks so that they can perhaps understand the risks involved with interacting with dogs. Below you’ll find information regarding common injuries that result from dog bite attacks and common types of recovery injured parties can obtain in a California dog bite attack lawsuit. If you have been harmed in this manner, contact the California dog bite lawyers at the Dog Bite Law Group today to schedule a free initial consultation. Numerous serious injuries can occur as a result of dog bite attacks. According to the United States Centers for Disease Control and Prevention, or CDC, up to 18 percent of dog bite wounds become infected with some form of bacteria. Some of these bacteria are extremely dangerous and harmful to humans. Every case is different, but each of the types of injuries and infections above can be extremely painful and involve seemingly endless medical care and ongoing costs. According to a report released by the American Society of Plastic Surgeons in 2015, approximately 28,000 people in the United States needed some form of reconstructive surgery because of dog bite injuries. Dog bite attacks inflict a lot of damage on the people who are wrongfully injured as a result, as well as their families. California personal injury law exists so that people who are injured because of the negligent actions of others deserve justice. In California dog bite cases, people are seriously injured and justice is only served if those injured people have the right to recover for the harm they suffer. Below are some examples of the types of damages that a plaintiff can recover in a California dog bite attack lawsuit. Economic damages are those that can be directly tied to tangible forms of economic loss. Past and present economic damages are not estimated, but future economic losses are. Medical costs – A plaintiff can recover the costs of medical care received because of injuries suffered in a dog bite attack. This includes future medical costs necessary to treat the injuries to the extent that treatment is advisable. Lost income and/or earning capacity – It’s common for people who have been injured in dog bite attacks to miss time at work, and for many that means lost income. That lost income can be recovered, and once again recovery can include income that will be lost in the future. Ongoing future medical care – Some people are so severely injured in dog bite attacks that they will need certain forms of help such as special equipment to remain mobile. All of those past, present and future costs can also be recovered. Emotional distress – A person injured in a dog bite attack can suffer severe and sometimes permanent emotional injuries that include fear of dogs or even spending time in public places. This includes sleep deprivation from nightmares, fear of dogs, etc. Pain and suffering – Clearly, someone who is injured in a California dog bite attack is going to face ongoing physical pain and psychological trauma. This trauma can lead to compensation. Loss of companionship – Some California dog bite cases are so severe that a person is unable to enjoy life with his or her spouse and/or family afterward because of the love they shared and loss of support in daily life. This form of loss can be quantified by an experienced California dog bite attorney. If you or someone you love has been injured in a dog bite attack, you need to take action in several ways as soon as possible. Clearly, you need a lawyer for Dog Bite Injuries and Financial Recovery for all of the medical help you can get, and that may include psychiatric help to deal with your emotional injuries that are common in these incidents. You also need to obtain an understanding of your legal rights and potential recovery options as soon as possible. 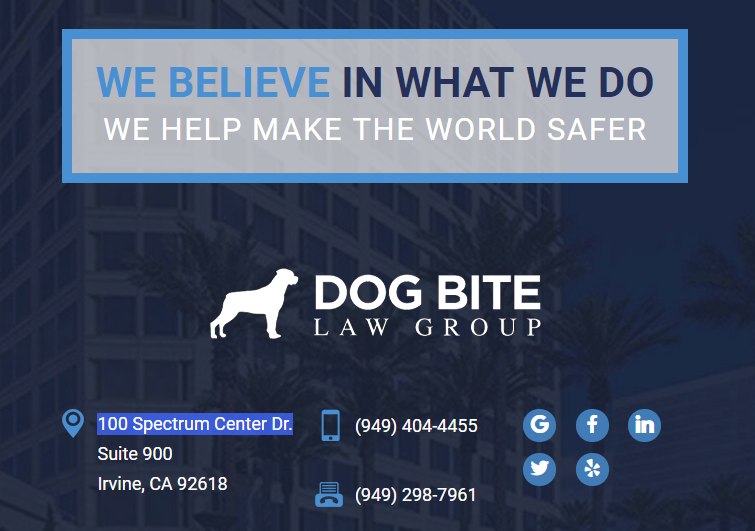 You can obtain that understanding by seeking the advice of our Irvine Dog Bite Attorney who has been helping clients defend their legal rights for years. Contact the Dog Bite Law Group today to schedule a free initial consultation.